What information can they present? If you have any questions or suggestions you are welcome to join our forum discussion about Patterns Including Two Candlesticks. In the previous article you were made familiar with different single candlestick patterns. Before we move on to your study of long-term chart patterns, you will be acquainted with the rest of the most popular short-term ones – double and triple candlestick patterns. In the next few lines we will be covering the following double candlestick patters – Engulfing, Dark Cloud Cover and Piercing Line, Tweezers and Harami. The engulfing pattern is a two-bar/candlestick pattern, which, especially in the perfect scenario, is a very strong reversal signal. However, because the pattern is designed to signal trend reversals, it logically requires the market to be trending in order to work. Therefore, during a trend, a bearish engulfing pattern would signal that the market is at its top and a bearish trend might follow, while a bullish one suggests that the market has bottomed and a bullish trend may be forming soon. Here is how they look like. 1. As mentioned above, the market needs to be in a confirmed trend, no matter long or short-term. Sideways price movement does not work for the engulfing pattern. 2. The two candles must be of opposite type, i.e. one needs to be bullish and the other – bearish. For example, if the first candle is bearish, then the second one must be bullish and will complete a bullish engulfing pattern, and vice versa. 3. The body of the first candlestick/bar must be smaller than the second one’s. It is not necessary for the second candlestick/bar to additionally engulf the wick of the first one, but still its high-low range must be at least equal or exceed the first candlestick’s high-low range. The perfect engulfing pattern assumes that the second candlestick’s body engulfs the entire first candlestick, including its shadows. 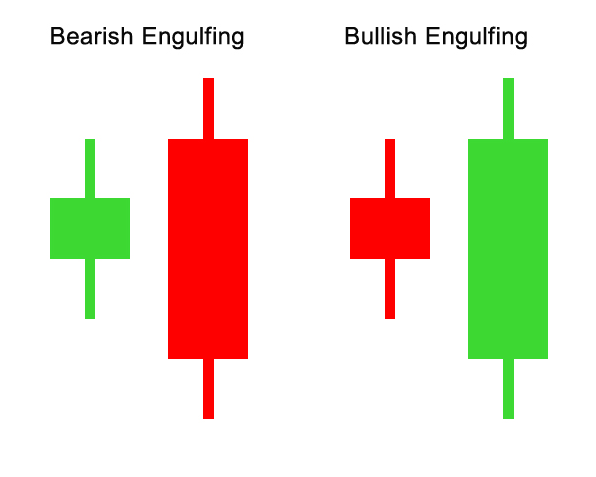 If the engulfing is formed after a Doji candlestick, it makes the pattern even more powerful. The general rule is that the smaller the first candle and the larger the second one is, the stronger the engulfing pattern is. The smaller the difference between the two is – the weaker it will be. When both candles are almost equal, then the pattern is almost irrelevant and could lead to sideways trading, instead of a price reversal. An engulfing pattern is considered failed, if the market marks a close below the low of a bullish engulfing pattern or above the high of a bearish one. The opposite scenario renders it successful. 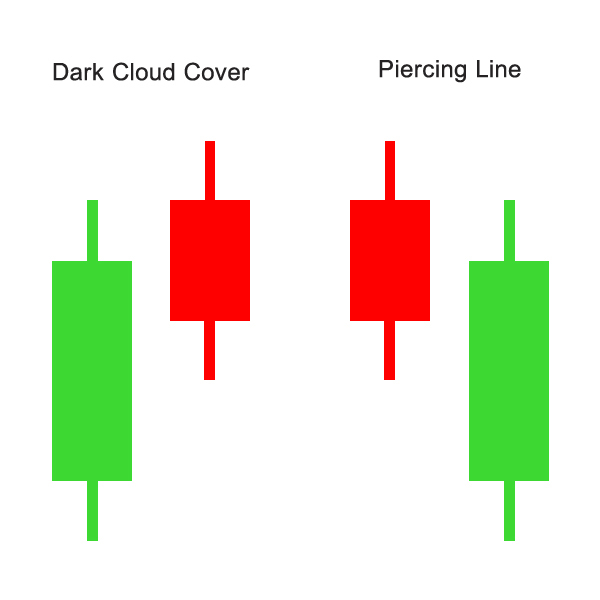 Another double candlestick pattern signaling trend reversal is the Dark Cloud Cover and its opposite – the Piercing Line. The Dark Cloud Cover is a two-body pattern forming at a top and signaling a bearish reversal. The first candle is large and bullish and the second one is also large, but bearish. The second candle should open above the upper wick of the first one, therefore, forming an upward gap, but the price should then move lower and close within the body of the first candle, preferable below the 50% level. This pattern’s strength is enhanced the further the penetration is, but a complete penetration will be an engulfing pattern. Check the picture below. Basically the logic behind that pattern is that we have a strong upward movement, illustrated by the first large bullish candle, which is even continued in the second period, illustrated by the initial upward gap between the two candlesticks. However, at that point, the bears regain strength and overcome the bulls, pushing the price lower, closing it within the body of the previous candle. The perfect setup of the Dark Cloud Cover assumes that the second candle closes beneath the middle of the bullish candle’s body. However, in liquid markets such as Forex the requirements for this pattern may be more flexible. For example, the bearish candle may open above the close of the bullish one, instead of its high and its close may not be so deep. However, if the second candle’s close does not reach at least the middle of the previous one’s body, the pattern is considered as inconclusive. The Piercing Line pattern is the opposite of the Dark Cloud Cover. It forms after a strong downward movement and can signal that a support has been hit, giving us an early sign that a retracement is due or even the formation of a bullish trend. All the rules for Dark Cloud Cover apply for the Piercing Line pattern, but in reverse. Here is how it looks. Tweezers are another double candlestick pattern, which signals a price reversal. 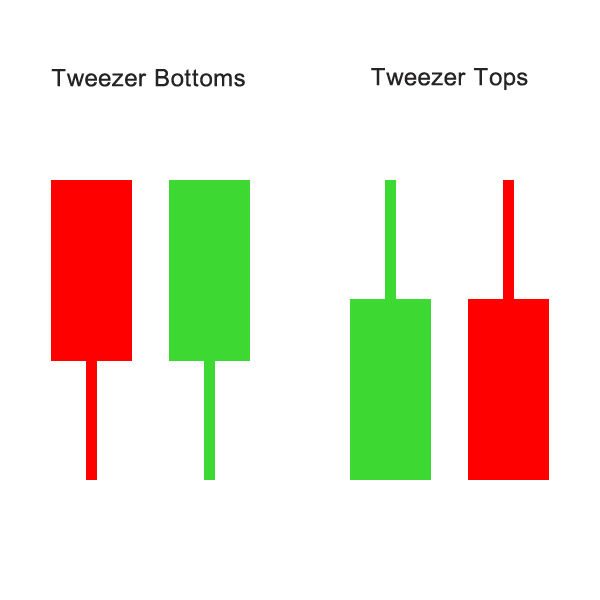 Just like the previous ones, we have a bearish and a bullish version, called Tweezers Tops and Tweezers Bottoms. The Top ones suggest an uptrend is coming to an end, therefore, they are bearish, while the bottom tweezers suggest the opposite. Here is how they look like. Tweezers are formed by two opposite candles, a bearish and a bullish one, which have matching highs and lows. And just like the previous two double candle patterns, they require the market to be in a distinctive short-term or long-term trend. Basically, what this pattern is telling us, is that at the wick of the first candle in an uptrend, the buyers have been overpowered by the sellers. The second candle’s shadow then illustrates a second attempt by the buyers to push the price higher, but the sellers seem to have gained control over the market and after two unsuccessful attempts by the buyers to prevail, the sellers manage to push the price lower. The general requirement for the formation of the tweezers is that their highs or lows match, regardless if it’s their bodies or shadows that match each other. For example, you could have an engulfing pattern with the highs or lows of the two candles matching – this would still be a tweezer. Moreover, you can have more than two candlesticks taking part in the formation of the tweezer pattern and they all need to have matching highs or lows. The perfect scenario of a Tweezer formation assumes that the size, tops/bottoms and shadows of the two candles are very similar. The pattern will be even more powerful, if they are twin-like. There could also be some variations. For example, the first candle does not necessarily have to be matching the previous market tendency (bullish in an uptrend or bearish in a downtrend), just like the second candle is not mandatory to be the opposite of the trend. However, if they are, that would make the pattern stronger. The bodies of the two candles do not need to be of the same size, and even the matching lows/highs might have a slight difference, but the more exact they are, the higher the probability of a price reversal is. 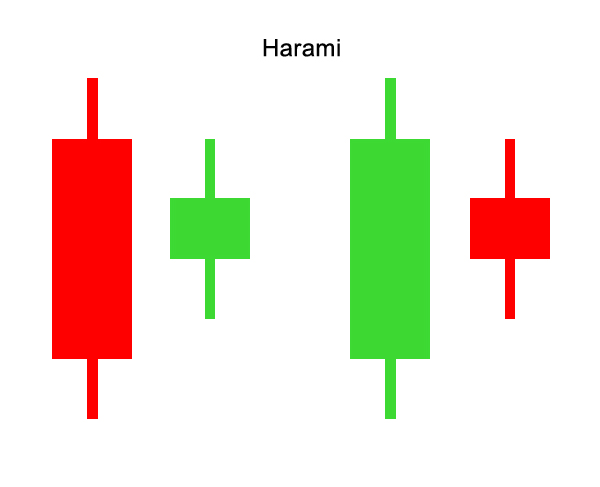 Harami is another double candlestick pattern, which consists of a large candle of either color, followed by a small candle, whose body is completely engulfed in the boundaries of the previous candle’s body. Here is how it looks like. The second candle is called a spinning top and can be a Doji, Hanging Man, Shooting Star or a Hammer. The only requirement is that its body must be within the first candle’s body. The shadows of the spinning top do not necessarily need to be in the range of the first candlestick, only body-to-body. Therefore, it is the open-close range, not the high-low, which is what determines whether the pattern plays out. The interpretation of the Harami pattern goes in two ways. Because the second small-bodied candle indicates a decrease in volatility, which in the short-term is often followed by a spike in volatility and the formation of a new trend, the Harami pattern can signal both a trend reversal or acceleration of the current one. It all depends in which direction the price breaks.